Mozart’s first six piano sonatas were composed in the span of a few months in 1774 and 1775. In a letter written to his father on 17 October 1777, Mozart said that he had performed all six of them from memory in concerts in Munich and Augsburg. Thus the unitary conception of this sonata cycle is evident. It is also apparent from the sequence of keys, which is assuredly not accidental: C major, F major, B flat major, E flat major, G major, D major. 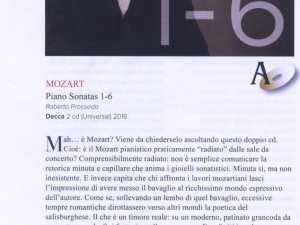 In these first sonatas it is already clear that the experience of musical theatre influences Mozart’s pianistic inspiration, with an imaginative sense of drama and timbre that has few equals: significantly, in the same period Mozart had completed the opera buffa La finta giardiniera K 196. These six sonatas are all characterised by a persistent combination of drama and playfulness, seriousness and facetiousness, with sudden changes of mood. Sonata K 279 is still anchored to baroque stylistic principles, already evident in the first group of themes and the frequent repetition of the same phrases. Yet Mozart moves away from the more conventional parts and alternates them with more personal passages that seem to comment ironically on those models. The central movement is a calm Andante in F major with a nocturnal quality, but imbued with sudden lively passages and melodic leaps, such as the rising seventh from C to a high B flat, repeated several times in the course of the sonata. The repeated dissonances enrich the narrative tension, which reaches its culmination in the central development. In the third movement, also in sonata form, there are frequent similarities to sonatas by Haydn, recognisable in the exaggerated use of hammered staccato notes and in unexpected interruptions. From the very beginning, Sonata K 280 is based on constant contrasts. It has a rhythmic opening with repeated chords, but already in the third bar there is a change of tone, with a descending chromatic line and a regular rhythm of quavers in the left hand. The second theme is also based on the opposition of two elements: three forte staccato octaves are followed by rapid quadruplets of piano semiquavers, and the entire development is based on this material. The second movement is a touching Adagio in F minor. From the very first bar there is an abundance of semitone intervals, immediately repeated in all the parts, which express a sense of deeply-felt disheartenment. Yet an unexpected “change of scene” in bar 9 is all that is needed to produce an utterly different effect: the melody is more extended but is constantly interrupted by pauses that give the passage a particular sense of fragility. In the final movement, Presto, there is a return to playful, darting moods, here too with a savour of Haydn, and it is developed by juxtaposing elements of a contrasting nature. Sonata K 281 presents a greater variety of inflections. The initial theme sets out various rhythmic patterns (trill, triplet, quadruplet) in quick succession, suddenly interrupted by abrupt chords. The second theme begins “on tiptoe”, with a C struck six times, taking on a playful, almost coquettish quality. This is followed by an enchanting Andante amoroso that combines delicacy and tenderness in an intense but uncertain lyricism. The last movement is a brilliant virtuoso Rondo in which Mozart alludes to the dialectic between solo and tutti. And, just as in a concerto for piano and orchestra, there are also brief cadenzas with an improvised quality. Sonata K 282 begins not with the usual Allegro but with an Adagio, but it is in sonata form. The tone is meditative and we find various echoes of motifs from the preceding sonatas: the outline of the first theme is very similar to that of the Adagio in K 280, although here the mood is more serene and reminiscent of that of the Andante amoroso in K 281. In the brief central development the tension becomes more anguished as a result of the reiteration of harsh dissonances. The recapitulation begins unconventionally, starting directly with the second theme. The first theme reappears unexpectedly, however, in the brief, enchanting coda. The second movement consists of two contrasting Minuetti: the first is playful and rhythmical, while the second is more expansive. They are both sprinkled with humorous features, such as sudden loud chords, dynamic leaps and brusque interruptions. The sonata concludes with a brief Allegro in sonata form, of remarkable virtuosity and with a playful quality. Sonata K 283 is very different in colour from the preceding sonatas. This is also due to the choice of the key of G major, which, with unequal temperament, sounds particularly warm and sunny. The first movement is based on metric ambiguity: the score is written in 3/4, but at various points the writing hints at a subdivision of the bar into 6/8. The writing makes extensive use of dynamic leaps and accents on weak beats to increase the musical tension and, in some cases, to obtain a humorous effect. In the concise development we do not find either of the two themes, but there are “echoes” of both in the rhythmical interjections and in the articulation. The second movement is exemplary for its miniaturisation of drama. In fact, in just three pages, here Mozart presents a short operatic scene. The first theme, distinctly bel canto in origin, begins gently with four repeated Cs and then progresses to greater melodic breadth, also as a result of the ornamentation. But it is in the short development that we come to the drama: the same theme now appears in D minor and sounds lost and fearful. The sudden harmonic suspensions, with interrupted cadences, create an immediate increase in tension. Equally disconcerting is the recapitulation, achieved not by means of complex modulations but simply with a “bare” ascending chromatic scale that, in this context, sounds incredibly poetic and natural. The last movement is a Presto with a remarkable virtuoso fervour, based on rapid leaps and sudden changes of rhythm. Sonata K 284 is known as the “Dürnitz Sonata” because it was commissioned by Baron Thaddäus Wolfgang von Dürnitz, an amateur bassoonist and pianist. However, the difficulty of the piece seems to be addressed exclusively to professional pianists. The musical discourse develops in long structures, whereas the preceding sonatas progressed by means of short alternating passages. For this reason, the Dürnitz Sonata is certainly one of the most (pre-)Beethovenian of Mozart’s sonatas, together with the two sonatas in minor keys, K 310 and 457. The first movement presents an instrumentation with a clearly orchestral conception, which Mozart developed gradually, as shown by the fragment of the first version recorded here at the end of the sonata. From a comparison of the two versions we can see that the writing was originally leaner and more essential, and it is only in the definitive version that Mozart decides to thicken the sonorities by a greater use of double octaves and tremolos, evoking brass and strings, respectively. The treatment of rhythm is developed from bar 4 onwards by means of a constant movement of repeated quavers which give a particular impulse to the discourse. The second movement is not of a meditative nature, as one would expect, but consists of a Rondeau en Polonaise full of galanteries. The dynamic indications are most meticulous and succeed in varying each return of the initial theme, which always reappears in a more ornate guise. The third movement, lasting over fifteen minutes, is the real heart of the sonata. It is a theme with twelve variations in which Mozart continually varies the writing and the emotional setting. Behind its apparent simplicity the theme conceals some compositional subtleties. The structure is, in fact, asymmetric, with two parts, comprising 8 and 9 bars. The “extra” bar in the second part consists almost entirely of a pause, followed by the initial opening. This increases the fascination of each of the variations, in which Mozart repeatedly finds a different solution to “fill” the extra bar. The slow Adagio variation is particularly touching. In the first printed edition (Torricella, Vienna, 1784) it is published with a great wealth of ornamentation, adopted here in its entirety, which gives us an idea of the subtlety and originality with which Mozart was able to vary expression on the piano. Is there really any need for yet another recording of Mozart’s sonatas? Is it still possible to say something new when playing these compositions while maintaining respect for the score and for the composer’s indications? If Mozart were alive today, would he prefer to perform his sonatas on a fortepiano of the time or on a modern piano? These are questions to which it is not possible to give an unequivocal answer, but on which I have reflected a great deal, also profiting from the availability of the sources and of many recent philological studies. In the letter to his father cited earlier, written on 17 October 1777, Mozart declared his enthusiasm for a new Stein piano that he had tried out, which was provided with a rudimentary system for working the dampers (corresponding to the right pedal on modern instruments). Referring to the sonata in D he said that it “has an incomparable effect on Stein's pianos. The pedals, pressed by the knees, are also better made by him than by any one else; you scarcely require to touch them to make them act, and as soon as the pressure is removed not the slightest vibration is perceptible.” This shows Mozart’s curiosity about innovations and his readiness to experiment with instruments that provided greater expressive variety. Nowadays it is possible to consult the manuscripts of the first six sonatas, currently held at the Biblioteka Jagiellońska in Kraków, and there are various critical editions that compare the manuscript version with the first published editions. On looking at the scores one is struck by the large number of original articulation marks, which we do not find so abundantly in the subsequent sonatas. I have tried, therefore, to observe the original phrase marks and dynamics attentively, even in cases in which tradition has accustomed us to softer sounds and smoother contours. It is from those phrase marks and the different kinds of staccato (dots or wedges) that one can deduce how Mozart imagined that a musical phrase should be “pronounced”. The dynamic signs, here apparently limited to forte and piano (occasionally crescendo or decrescendo, and very occasionally pianissimo), also reveal a poetic world in which contrasts are fundamental for the definition of suitable expressive variety. In order to render those intentions as well as possible I needed a particularly sensitive instrument with a different sonority from the usual “artificial” sound of the modern piano. Therefore I considered recording the sonatas on fortepianos of Mozart’s time and I tried out several historical instruments and some recent copies. Practising with the fortepiano has been of great importance for me. It has enabled me to discover sounds and manners of expression that have allowed me to enter more deeply into Mozart’s world and to enrich my imagination in terms of timbre. However, I have had to recognise that my “mother tongue” is still the modern piano, an instrument that I have been playing for nearly 40 years and one with which I am able to give immediate expression to a greater variety of musical intentions. So I decided to use a Fazioli concert grand built in 2015, generously made available by Paolo Fazioli at the Fazioli Concert Hall in Sacile. The very refined mechanism of this instrument and the sensitivity of the soundboard, particularly responsive to differences of touch, make it possible to obtain many nuances of colour, clearly rendering differences in articulation. It is also possible to play with microdynamics even in contexts of extreme rapidity, such as in trills or short phrases, and to perform the original forte-piano indications, i.e., a sudden dynamic shift in a held note. The idea of recreating the transparency of the fortepiano sound led me to reduce the use of the sustaining pedal to the minimum and to seek sounds verging on silence in the rare cases in which Mozart indicates pianissimo. The particular colour of recordings on a fortepiano is also determined by the historical tuning, which does not use equal temperament. Prompted by a suggestion given by my friends Jan Willem de Vriend and Stuart Isacoff, to whom I am most grateful for their valuable advice, I asked Fazioli to tune the piano in accordance with the “Vallotti” unequal temperament, quite unusual nowadays on the modern piano but very widespread in the years when Mozart composed these sonatas. The difference from the normal modern tuning lies in the different colour that each key acquires as a result of dividing the octave into twelve unequal semitones. Thus each sonata has a quite particular character, and it is understandable why Mozart set certain movements in a particular key. For example, the F minor of the Adagio in Sonata K 280 here takes on a decidedly grief-stricken tone, not just one of melancholy. And when, after the opening passage, we come to the section in A flat major, it sounds more precarious and illusory, suggesting the idea of a happiness only imagined, very far from reality. In the transitions from one key to another, regardless of whether they occur abruptly or gradually, this makes it much easier to capture the shift from one harmonic (and emotional) setting to another much more convincingly. The dissonant harmonies sound much more jarring and “distressing”, emphasising the dramatic and visionary capability that is already present in these early sonatas and that makes them, nearly 250 years later, music of great power and modernity.